Close coordination with the property owner and designer allowed stream restoration efforts to support the Proximity Hotel’s LEED Platinum Certification. 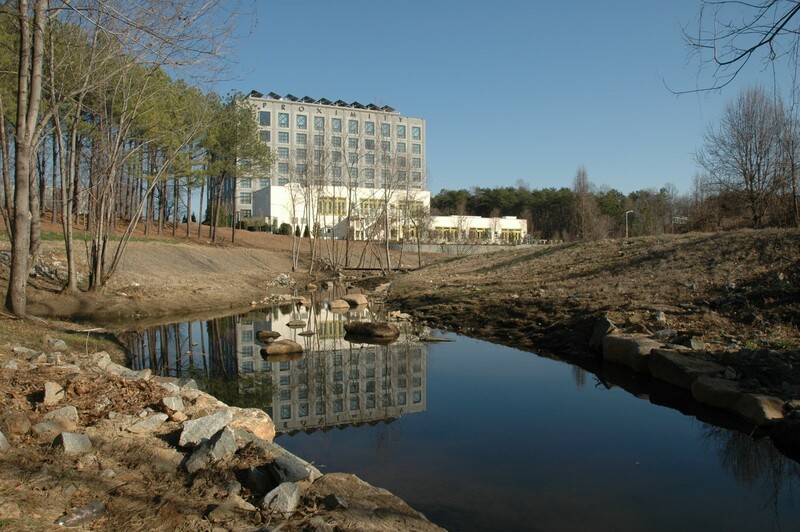 S&EC was responsible for the restoration design of approximately 650 linear feet of piedmont stream and its associated riparian buffer on the LEED Platinum Certified Proximity Hotel property in Greensboro, NC. Project tasks included the evaluation of existing impaired/impacted site conditions, the development of a conceptual restoration plan, the production of construction documents, and a flood study to verify a “No-rise” condition along this FEMA mapped stream. The project utilized reference reach data and Rosgen-based natural channel design methodologies for stream restoration. Services also included regulatory coordination and environmental permitting (404/401), construction observation, and as-built data collection and project certification.